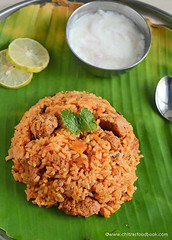 Yesterday I posted a simple brinji rice recipe in my Sunday lunch recipes series. 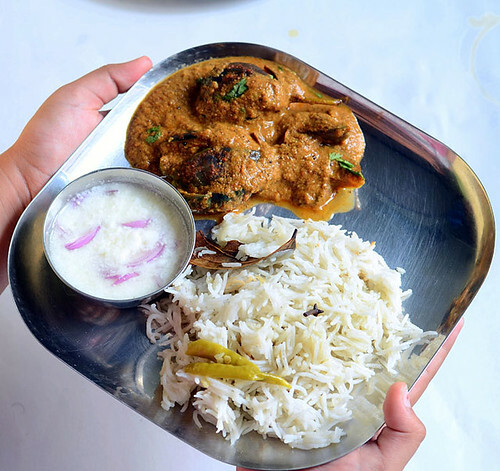 When I shared the picture of brinji along with brinjal gravy as side dish, I got so many requests in my facebook page and emails asking me to share the recipe of brinjal gravy for biryani. I was very happy to see so many brinjal fans like me. So without any delay, I am posting the recipe of most popular biryani brinjal curry for you all. 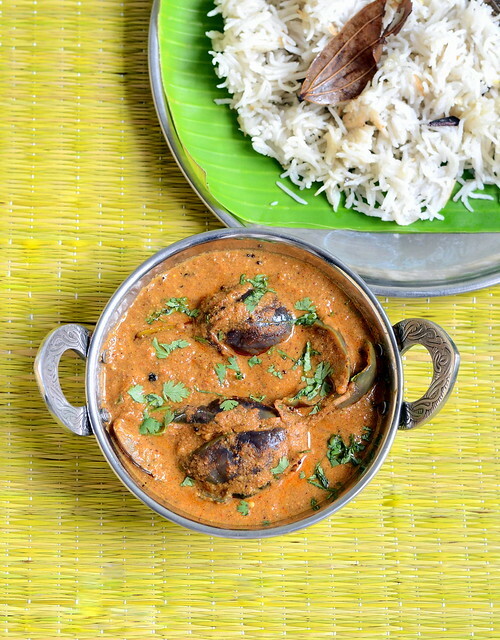 Basically this brinjal curry/gravy is served as a side dish for biryani in muslim marriages and in restaurants. Be it a veg or non-veg biryani, this kathirikai curry serves as a great side dish. Some people call it as “Brinjal pachadi”too. 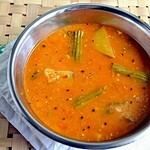 You can find many variations for this recipe.You can make it as a thick curry or a thin gravy as you wish. 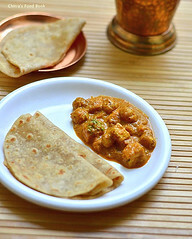 I came across few simple recipes without grinding part and some with freshly ground masala. 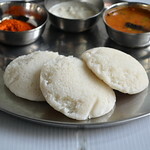 I chose the recipe from a Tamil magazine “Kumudham Snegidhi”(Thanks to Edwin edy of food-fun-friends(Facebook group)for sharing a clip from magazine) and from Mye’s blog which was very close to the one given in the magazine. The procedure may look lengthy but its sure a worthy try. You will get an awesome,mouthwatering,flavorful brinjal gravy.Even a brinjal hater would like to taste a small piece of it. In my house, both Sendhil & Raksha hates brinjal recipes. But when I was making this gravy, Sendhil came inside the kitchen by smelling the nice aroma and asked me what I prepare. 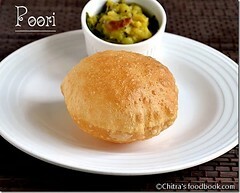 That yummy aroma made him eat the gravy along with brinji. He loved the combo a lot and took two servings!! 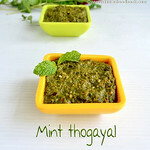 Friends, do try this gravy as a side dish for biryani for your guests and parties/get together. 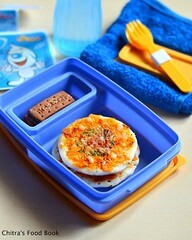 I am sure, this will become a super hit recipe ! 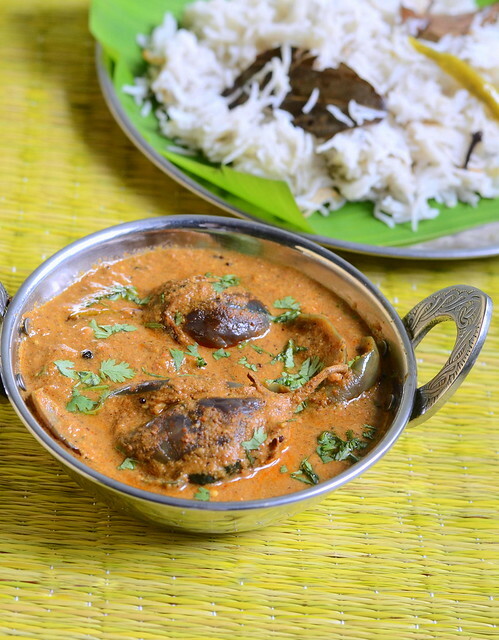 Ok, lets see how to make this delectable brinjal gravy for biryani with stepwise pictures ! 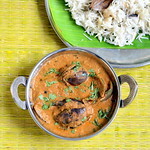 Brinjal curry for biryani- Yummy side dish for biryani ! 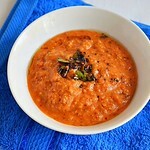 Grind the onion to a paste and set aside.Grind tomatoes to a puree.Keep aside.Soak tamarind in little water. Heat a kadai and roast the peanuts.When the peanuts get half roasted,add the sesame seeds and khus khus.Roast them till it splutter and switch off the flame.Let it roast in the heat of kadai.Grind the roasted ingredients along with tamarind to a smooth paste adding enough water.Make it thick because u have to stuff the brinjal. Wash and slit the brinjal into 4 pieces without removing the stem.Stuff it with ground masala paste.Keep the remaining masala aside. Heat oil in a kadai and splutter mustard seeds.Then add cinnamon,cloves and cardamom.Add pepper corns and saute for a minute.Then add onion paste,g&g paste.Saute well for sometime.Then add the tomato puree and saute till raw smell went off.Add the chilli powder,turmeric powder and salt. Now add the stuffed brinjals and the remaining ground masala.Saute for sometime till the mixture becomes thick.Add some water and close the kadai.Cover cook till brinjal cooks well.If u want to make a thick curry,evaporate all the water by boiling it OR add some water and bring it to thin consistency.Serve as a gravy with biryani ! Adjust the consistency of the dish as u wish.I made it as a semi gravy. Add more red chilli powder if u want the gravy to be more spicy. U can garnish the gravy with coriander leaves at the end. You can also add garam masala powder for extra punch . This brinjal gravy is a yummy side dish for biryani and it tastes good with plain rice too.Try n let me know! 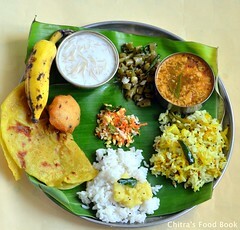 Yummy curry Chitra,the same way I do I also add dry coconut while making a paste,sure will try tis way. I love brinjal gravy in any form...Strangely I have a similar recipe from my telugu friend - only difference is that she uses tamarind water and also in the grinding portion there is copra! Gives it a very earthy flavour. Lovely pics Chitra. Thank you. 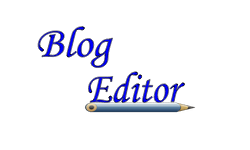 Please try n share ur feedback.